BBC Week continues over at Amazon, with today's Gold Box Deal offering up a modern take on Robin of Sherwood that doesn't star Russell Crowe and never features an army of urchins riding to battle on very small horses. 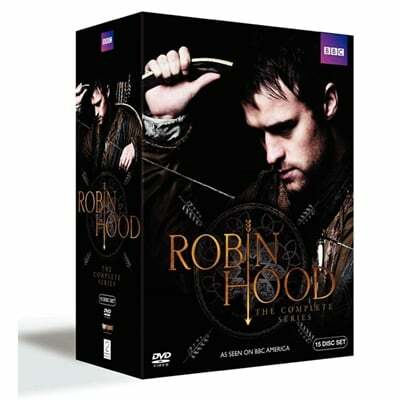 Yes, Amazon has discounted the entire run of the recent BBC Robin Hood series 58%, knocking the price down to a mere $41.99 for three seasons of arrow-knocking. I still haven't seen a single episode of the show, and I've heard reports both good and bad. Still, even if it's uneven, that's a damn good price for a set that normally lists for a hundred bucks. Granted, it would have to be pretty astounding to top my personal pick for the best version of the legend. Assuming Amazon is only doing this BBC Week thing through tomorrow, we've got one day and one deal left. What would you like to see price-slashed? I'm rooting for Fawlty Towers or Black Adder. Sound off in the comments below or over on Facebook.